Hold the front page - can print newspapers adapt to the online world? Rupert Murdoch, owner of News International, has been known for his occasional outbursts. Murdoch, whose papers include The Sun, The Times and The Wall Street Journal, has said that, once his papers start charging for online news, he will stop content appearing on search engines like Google or Bing. While Murdoch has been known for his loathe-hate relationship with the search engine giant – once describing the aggregated content on Google News as a "parasite" - Google was not the only search engine to face his wrath. In an interview with Sky News Australia, Murdoch laid the blame for the recent decline of News Corporation's profits squarely at the door of every search operator. You can watch the full interview – all 37 minutes of it – here. The plight of News International is not unique. Newspapers across the world are facing a decline in advertising, a drop in profits and a fall in readership. Murdoch's comments – as incendiary as they might have been – resonated with those bosses in the same position. A recent study by Dharmash Mistry, a former Emap executive, said that in order to match their current digital advertising revenue, newspapers merely had to convert four per cent of their online audience to a paid subscription tariff. The question facing many newspapers – both regional and national – is how to accomplish this. The decline in circulation sales has seen many publications try to reach their audience through other ways. 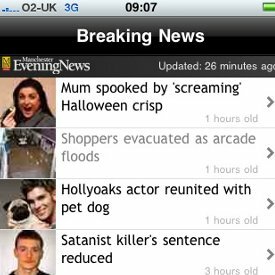 A number of newspapers – most recently, The Manchester Evening News – have re-tuned their content for mobile phone readers. Indeed, this year, the UK Association for Online Publishers revealed that 85 per cent of British media declared mobile web presented the biggest opportunity to financial growth. Furthermore, a number of media outlets now offer exclusive content via the Apple iPhone App store. By paying a small one-off fee, users can have access to a range of exclusive content on the go. "Mobile phones give newspapers a great way to broadcast their content to a wider audience," said Mark Baker, online marketing manager for theEword. "A person may not have the time, or inclination, to buy a newspaper in the morning. Users are more likely to read their news via their mobile – it gives them the chance to quickly find and digest the stories relevant to them." A number of different methods are being trialed for the use of paid-for mobile content. Ericsson is currently expanding its Web Pin Opt-in mobile payment system, an application which gives users the opportunity to pay for mobile content directly from their mobile phone bill. Time will tell whether or not this proves to be a success with readers. One of the main issues facing those considering a paid-for subscription service is that of content. How can you persuade a reader to part with their money for information they can read for free elsewhere? While Murdoch is attempting to stop the 'hemorrhaging' of his news stories to other sites by considering legal action, other publications have decided to attract users by narrowing their market or choosing to concentrate on a specific demographic. Many business and financial publications have found success in this area. Crain's Manchester Business gives users the opportunity to read its hyper-local business coverage for a yearly sum of £84. Michael Hirshorn wrote last year in an American newspaper that: "Journalistic outlets will discover that the Web allows (okay, forces) them to concentrate on developing expertise in a narrower set of issues and interests, while helping journalists from other places and publications find new audiences." A number of newspapers have been quick to harness social media as a way to direct users to content. 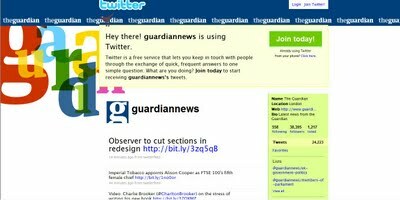 The Guardian Newspaper has 39 active Twitter accounts, covering a wide range of different topics – ranging from Guardian travel to Guardian USA. Each profile highlights different articles which users can read on the Guardian website. It is possible that social media could be used to complement a paid-for subscription service. Musicians often use the micro-blogging service to highlight new tracks or exclusive new material. If more publications decide to follow Rupert Murdoch's subscription model, perhaps we will see an increase in the number of papers using Twitter to attract subscribers.